5 peer counselors are selected, often from past camp participants, who have graduated from High School and are pursuing a secondary education in natural resources. 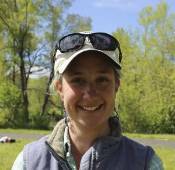 Meredith is the NRCS Soil Scientist for Utah Before coming to Utah she worked as a Soil Scientist in Montana, Minnesota, and Iowa. She provides project-specific soils information and training assistance, helping people understand the soil as a resource. At the soils station, students will learn how the soil forms and functions in the landscape, and its implications for different management and land uses.